Morgan Alexander does the double- European Combat Vice-Champion and World Assaut Bronze Medallist 2018! Morgan Alexander (Cambridge Savate) represented Great Britain valiantly in Paris this September as the first ever British Savate Combat European Championship finalist. Less than one month later, Morgan reappeared in the ring to challenge for the World Assaut title and came home with the Bronze medal. An inspiration to all Savate fighters that being at the top of the game (in both Combat and Assaut) is possible! 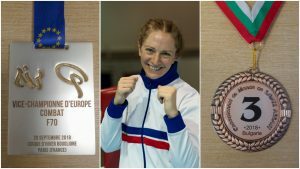 The finals of the European Savate Combat Championship were held at the Cirque d’Hiver Bouglione on the 29th September 2018. Virginie Jean-Rose and her team were at the back of the circus to meet all the participants after the black car ride from the hotel some 45 minutes away. Needless to say Team GB ended up in a blacked-out vehicle with Team Russia! After a chance to scout out the venue before the event, the evening kicked off at 7pm with an opening Combat of 5 rounds (M56 category) fought between two Frenchmen. The European Championship finals then got underway with 10 categories being fought. France, Great Britain, Austria, Croatia, Italy, Russia, Spain, and Ukraine were each represented fighting out of the red corner, against the French fighters who took the blue corner for each bout. Fighters were housed in their own stalls – actual horse stalls from the old circus days which, who knows, might still be going?! We athletes waited quite literally in the wings before walking on to our chosen music and putting all of our hard work and months of preparation into practice. Morgan came up against French Champion Lorna Sincere in this fast-paced, full contact match. Although effectively placing some early leg and body chassés, ultimately Morgan succumbed to the French fighter’s heavy hands and so came home as European Vice-Champion. The GBSF is proud of our fearless women who compete in Savate Combat, and looking forward to seeing more British women representing Team GB.